Now that spring has sprung and summer has past, the hives I started this year are preparing to go into their first winter. Fall is the crucible of any new hive; a test of their ability to stand on their own six feet and survive. Once the queen breaks her brood cycle and stops laying for winter, the bees are more or less on their own. As a beekeeper, you can keep on jamming in some extra feed and ensure that they won't starve, but the most important factor is the basic health of the bees themselves. Bees are getting testy and I've started to wear a veil again. Smoking down Hive #2 while Alex Brown works his magic. The health of any hive is a mixing pot of a huge number of factors; genetics, location, food quality, food quantity, mite load, climate, and more. You can make an educated guess as to the status of many of these, but it is only a guess and sometimes bees defy your best intentions and die anyways. It's a gamble, and it's one that all beekeepers have to accept. 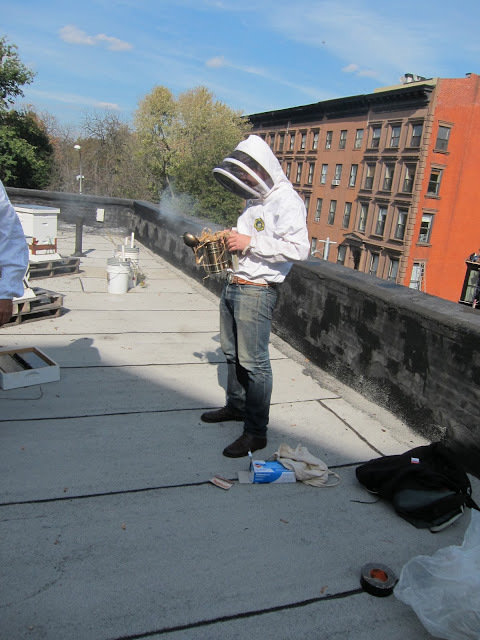 Beekeeping in the fall is all about trying to maximize the overall health of the colony in any way you can and minimizing any disruption of the hive activity. The bees have their proverbial proboscises to the grindstone and the less you interrupt them the better. At this point in the year, I'm doing a hive check every 2-3 weeks and even those are cursory. Not only do the bees have to scrounge up any last bit of nectar and pollen left to store away for winter, they have to combat dropping temperatures to keep their remaining brood warm and viable so that the colony has a fresh generation of the young winter (or 'fat') bees needed to keep the hive viable until spring. These 'fat' bees now being born will never forage for nectar or pollen. Their sole purpose in the hive is to maintain the temperature of the cluster throughout the winter and create enough heat (95F!) for the hive to begin raising new bees as early as February. To this end, the physiology of young workers born in the late fall is adjusted to maximize their usefulness as heater bees and nurse bees, as well as their long term survivability. These winter bees have more fat bodies (hence the term 'fat bees'), more sugar and fat in their haemolymph (blood), enlarged brood food glands, and lower hormone levels. These physical changes combined with the behavioral changes resulting from cold temperatures result in a lifespan measured in months rather than weeks. Winter bees tend to live about 6 months, and winter workers up to 12 months old have been observed. Summer bees work themselves to death in an average of 6 WEEKS. Most first year hives have to be provided with additional food to help them build up the stores required for winter, and mine are no exception. I didn't harvest any honey from these colonies this year and Hive #1, headed by the Brooklyn Queen "Esmeralda", looks to be in fine shape for the winter. The top hive body is full of freshly capped honey, there is a nice ring of pollen around the broodnest, and Esmeralda has drastically curtailed her brood laying activity. This is a good sign- it means that the bees have recognized that winter is coming and that they can't afford to maintain an excess population. Full of honey, each of these frames weighs over 10lbs. A hive of Italian bees require up to 100lbs of honey to make it through the winter. To put it in perspective, at NYC honey prices, they'll eat $3000 worth of honey by the spring. They'll need pollen to raise new brood in the Spring and it looks as if they have it. Throughout October, I've watched the broodnest slowly shrink from an area the size of a basketball, down to approximately half the volume. Still, a little extra food never hurt, so I've provided them with a little extra thick (2:1) sugar syrup and fresh pollen patties. Itty bitty brood nest, but nice and solid with a ring of eggs and young larvae. I'm gonna submit this to Mike and Tom Eat Snacks. Hive #2, headed by the Georgia package queen "Lazing", remains where it has been all year- lagging behind its sister. Despite having been fed significantly more than Hive #1, they have drawn significantly less comb. This is probably due to poor genetics and I am not really expecting them to survive the winter. Still, I'll do my best and force feed them as much as possible, just to hedge my bets. I can't do anything about their cruddy genetics at this point in the season, but at the very least I can make sure that they won't die of starvation. Lazing? More like lazy. Outermost frame of Hive #2. A bit better. Frame #2. Emily is comme ci, comme ça. Covered in bees! Hooray! Now we just need to fill it with food for the winter. This recent spate of warm weather has been extremely helpful, allowing me to make some last minute adjustments to the internal arrangements and dig in to the hive further than I might otherwise for fear of chilling the brood, but it will be over soon and I'll have to winterize the hives soon. Beautiful white cappings on their winter stores.